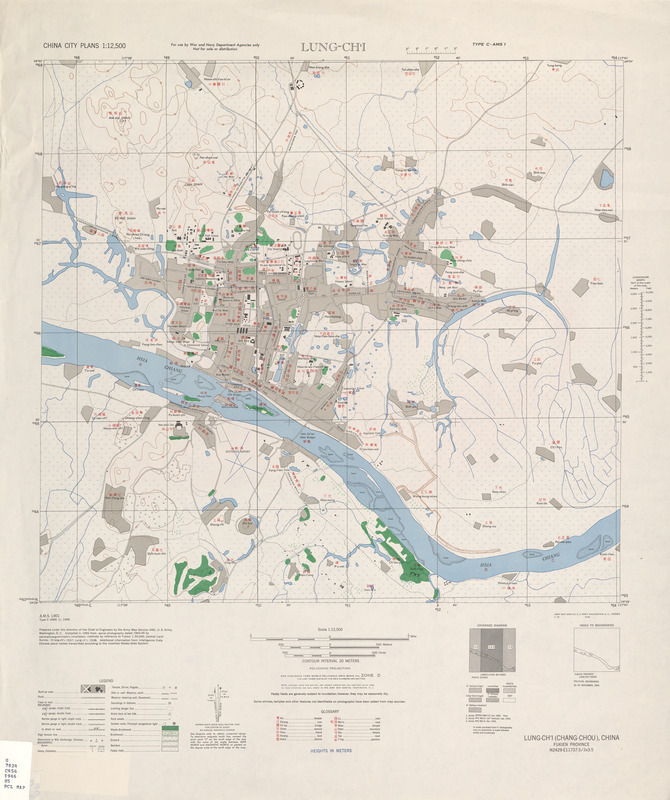 Zhangzhou (Cheenese: 漳州; pinyin: Zhāngzhōu; Wade–Giles: Chang1-chou1; Pe̍h-ōe-jī: Chiang-chiu; formerly Lung-ch'i) is a prefectur-level ceety in soothren Fujian province, Fowkrepublic o Cheenae. Locatit on the banks o the Jiulong River (Beixi), Zhangzhou borders the ceeties o Xiamen an Quanzhou tae the northeast, Longyan tae the northwast an the province o Guangdong (Shantou Ceety) tae the soothwest. Zhangzhou is home tae 4,809,983 indwallers at the 2010 census whom those o Longwen an Xiacheng destricts are considered as urban. Thir twa destricts, thegither wi Longhai an Xiamen, fairm a metropolitan aurie that, as o 2010[update], is home tae aboot 5 million indwallers. In aulder Inglis wirks, its name mey appear as Chang-chow or Changchow an in Sootheast Asian contexts it appears as Chiang-chew or Chiang Chew frae the Hokkien name. 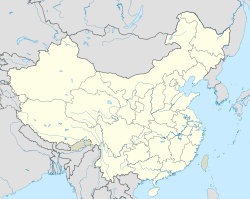 The main dialect spoken in Zhangzhou is Hokkien, ane o the major Min Nan leids/topolects. But offeecially, fowk uise Mandarin in govrenment, commerce an offeecial business. In the early 20t century, Zhangzhou-fu wis surroondit bi 42 miles (68 km) o waw (in circumference). Its streets wur paved wi granite, but struck some Wastren visitors as dirty, as reportit in the Encyclopædia Britannica. The Jiulong River wis crossed bi an 800-fit brig o widen planks supportit on twenty-five stane piers. At this time, hivy silk tradin activity occurred in the ceety, while brick kilns an succar-manufactures wur amang its primary industrial activities. In 1911, its population wis estimatit aroond 1,000,000. Zhangzhou's central urban aurie (nou Xiangcheng Destrict) wis occupied in Aprile an Mey 1932 bi a column o Communist guerrillas unner Mao Zedong. Due tae the presence o Wastren gunboats in Xiamen Bay, airms shipments frae the Soviet Union wur unable tae get up the Jiulong River tae Mao's forces an on tae the main Communist base aurie. Accordin tae some reports, Mao's forces teuk wi them a substantial amoont o loot frae bourgeois residents whan his column retreatit frae the ceety. Zhangzhou haes a monsoon-influenced humid subtropical climate (Köppen Cfa), wi mild tae wairm winters an lang, very het an humid simmers. The monthly 24-oor average temperatur ranges frae 13.2 °C (55.8 °F) in Januar tae 28.8 °C (83.8 °F) in Julie, an the annual mean is 21.3 °C (70.3 °F). The frost-free period lasts 330 days. The prefectur-level ceety o Zhangzhou admeenisters 2 destricts, 1 coonty-level ceety an 8 coonties. Chen Yuanguang (陳元光), 657–711 CE, militar leader important in facilitatin Han-naitionality dounset an control o modren-day Fujian an northren Guangdong. Khaw Soo Cheang, 1786–1882, Sooth Cheenae Sea merchant an a ryally-favoured Govrenor in Thailand. Lin Yutang (林语堂), 1895–1976, internaitional author, cultural ambassador a inventor. Wikimedia Commons haes media relatit tae Zhangzhou. 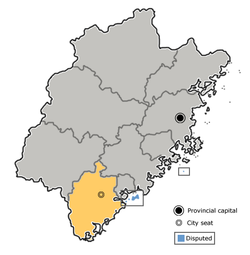 † Jinmen (Kinmen/Quemoy) is admeenistered as a coonty bi the Republic o Cheenae, but claimed bi the PRC.